Taste me. Photo: Le Phenix. 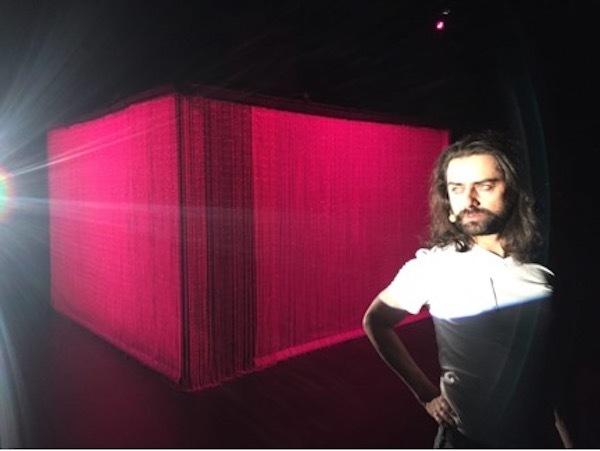 Gurshad Shaheman, French-Iranian playwright, performer, and translator is one of the most fascinating voices on the French contemporary theater scene today. His latest play Il pourra toujours dire que c’est pour l’amour du prophète (He can always say that it is for the Love of the Prophet) premiered at the Avignon Festival on July 11, 2018. The critic at Les Inrockuptibles, the well-known edgy French magazine, called this piece the most beautiful show of the 72nd festival and indeed it was in my view as well. The show’s title alone was sufficient to draw my attention to this play. I had been introduced to Gurshad’s work at the Festival transamériques in Montreal in May and I was looking forward to seeing his new piece. The stage is in the dark. A mysterious halo of light beckons the audience to lean into what appears to be a cavernous space in hopes of seeing what is happening there. A spotlight comes up on a young person stage front. She is sitting on the floor. Her eyes are closed. With microphone in hand, she begins to tell a story about her parents, a Syrian father and a Lebanese mother. How they met in Canada and fell in love but did not marry when she became pregnant. Before long we hear another voice and then another and another, each telling different stories, superimposed on each other and accompanied by Lucien Gaudion’s electro-acoustic score that creates a “labyrinth of sounds.” Lights come up slowly on a stage filled with other young people. Some are lying down, others are seated on chairs, others kneeling, some with their backs to the audience and others standing. The yellows, reds, white, blues and black of their outfits create a kaleidoscope of colors each bathed in pools of light. With only a flashlight, a bottle of water and a microphone, they tell stories, authentic tales it appears, of their flight from home and family, from countries where they could no longer live or be accepted. Their eyes remain closed as they recount the difficult journeys they have endured in order to reach a place of safety. In the beginning of their odyssey, they are caught in limbo, uncertain of what the future holds for them. Each of the stories they tell is unique. Some of them are unbearable to hear. The details of torture and suffering are intolerable yet you cannot turn away. Others are told with some humor despite the seriousness of their subject matter. Yasmine, for example, knew she was a girl at age 5 (she was born with male genitalia). Later we learn that she won a contest for modeling organized by the Elite-modeling agency in Agadir. When they found out that she was trans, she was not hired. Elliott fell in love in the Army at 18 and risked his life every day to be with his lover. Another voice describes the tortures he endured in Syria because of his homosexuality. His family wanted to put him to death but his grandmother saved him. Nowar was gang-raped and beaten so severely that he had to undergo major surgery. The 90-minute show’s title comes from a response from one of the refugees, Mohammad who fell in love with Bashar, a married man from Turkey who chooses to stay with his wife and children. Mohammad now lives in Germany. They speak to each other regularly via Whatsapp. Bashar has had Mohammad’s name tattooed on his arm. Mohammad tells his dear friend not to worry; if anyone ever asks him what this tattoo means, he can always says it is for the love of the prophet. As it turns out these tales are not the life stories of the performers on stage. In order to create Il pourra toujours dire… Gurshad traveled to Beirut and Athens, where he interviewed a number of people from the Middle East and the Magreb, most of them actors and directors and many from the LGBT community. They ranged in age from 17 to 30. He worked with a translator since many of the migrants did not speak Arabic or French. He would talk with them for hours. Their stories are the basis for Gurshad’s text, which is composed of fragments of lives rewritten and reconfigured by Gurshad into a kind of a documentary concert in three sections and two epilogues. In the middle section of Prophète…… we relive the dangerous journeys undertaken by each refugee, determined to survive despite the treacherous seas and frightening border crossings. We learn about their fear of falling into the water from the overloaded dinghies they have managed to commandeer by paying exorbitant prices to smugglers. We also hear about anguished moments of being pursued by Turkish patrols as they try to stay afloat in the middle of violent storms and the freezing cold. They somehow manage to reach their destinations. In the final scene, their eyes are opened to the future and the possibilities of new lives and new loves. They are now reinventing their lives not as victims or survivors, but as strong individuals who refuse the designated roles they were forced to embody. They want to be validated for who they really are. As the show comes to an end, one of the women happily sings “C’est si bon…” it is so good to be in love, even if it is temporary. Love has been the glue that has held them together. As a coda to this one of the refugees interviewed by Gurshad jumps up from the audience and races on to the stage to embrace one of the performers. Il pourra toujours dire que c’est pour l’amour du prophète. Photo: Christophe Raynaud de Lage. The voices of Yasmine, Mohammad, Lawrence, Daas and others are delivered by fourteen actors from a well-known acting school ERAC (Ecole régionale d’acteurs de Cannes) along with four of the refugees interviewed by Gurshad whom he invited to join them. It was important to Gurshad to make it clear to them that they are not playing roles or portraying characters. They are custodians of the text that he composed, reminding them that they are not delivering a dramatic text but are rather tellers of tales, transmitting memories of wounds that are still alive and lost loves that are still mourned. Gurshad himself is no stranger to the experience of exile and loss of identity. Born in Iran at the time of the 1979 Revolution, he grew up in Teheran during the Iran-Iraq war, with an attentive and loving mother who was only 23 years old and an authoritarian father who was frequently absent. In 1990 his mother divorced his father and took him and his siblings to France. There, he experienced the trauma of entering a French school at the age of 12, learning a new language and making his way through a foreign culture. He became fluent in French and a scholar of French literature earning a Masters in Literature. He also became a translator from Persian to French who is known for his translations of the novels of Reza Baraheni. He attended drama classes and graduated from the ERAC drama school in Cannes, subsequently performing in several plays as well as spending a year at Brown University. In 2017 he was awarded a Villa Medicis Hors les murs French Institute fellowship that allowed him to pursue his preparation of Il pourrait toujours dire …. At present, he is Associate Artist of the Phenix national theater in Valenciennes as well as Associate artist of the CDN of Normandie-Rouen for a period of 3 years. Gurshad also produces and performs in his “Cabaret dégenré” at the Point Ephémère in Paris. 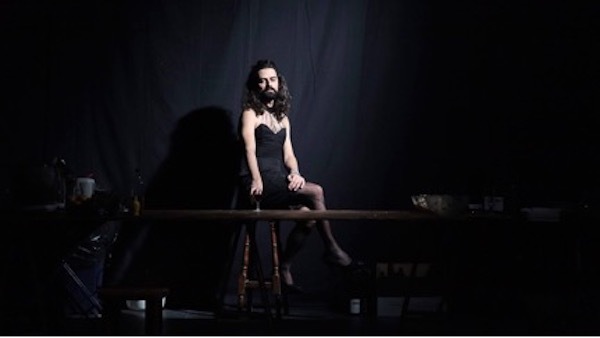 Pourama Pourama, Gushad’s first full play, seen at Montreal’s Festival transamériques in May 2018, written and performed by Gurshad, consists of three solo pieces Touch me, Taste me and Trade me. The mysterious title Pourama Pourama came from Gurshad’s misunderstanding of the words of a song, “pour un mois pour un an” “for a month for a year”). In Touch me, the audience is invited to make themselves comfortable on bright red cushions spread out throughout a black box theater. We are given a white half mask representing Gurshad’s father. As the play begins, a young man offers us a strawberry vodka drink from a table in a corner while Gurshad stands quietly among us ready to relate the story of his early years as a child growing up in Teheran, accompanied by family photos on a screen. His mellifluous voice draws us in with stories of his life in the family Gynoecium surrounded by his mother and cousins who fuss over the child of 4, dressing him up with the clothes they make for him. It is a harmonious life filled with laughter and hugs until his father, a civil engineer in charge of construction sites on the Iraqi front during the Iraq-Iran war returns home. He tells us that his father was a reserved, taciturn authoritarian man who would take the boy to the front to teach him how to be a man. One photo in particular of Gurshad as a child carrying a rifle is startling to say the least. His words are pre-recorded on a tape and broadcast on loud speakers. Suddenly the words “the performance will stop in one minute” unless someone in the audience goes over to Gurshad and touches him, appear on the screen. The count down begins. It is as if he must be touched in order to stir up his memories and continue his tale. In Taste me, we enter another space where we are invited to make ourselves at home at the tables and chairs spread around the room. We enjoy hummus, olives and pita bread along with glasses overflowing with delicious red wine as Gurshad, dressed in a black lace dress and high heels, prepares dinner for 70 people. A fragrant stew is percolating in a large “cauldron,” rice is cooking in another pot and Gurshad continues his story as he chops vegetables for the salad. With immense charm he tells us about his mother, who had wanted to study law, but ended up raising children and being a housewife who was unsuccessful at cooking until she came up with the delicious dish we are about to taste. We are transfixed by the hospitality and conviviality of Gurshad’s welcome. In Trade me the audience enters yet another theater space to find a closed-in rectangular structure covered with pink pearl beaded curtains surrounded by seats. This is the place of brief sexual encounters in exchange for money or other romantic meetings Gurshad will tells us about when he lived in Toulon and Paris, meetings in his studio or in backrooms or in hotels. It is his period of prostitution. When the audience enters this space, they are given a ticket with a number on it. As the play begins, a lottery wheel turns until it stops at one of the ticket numbers. If the ticket holder’s number comes up, he or she may go into this room. We can only imagine what is happening there. We strain to hear their conversation but only bits and pieces about desire and pleasure, disgust and acceptance float towards us. Trade me. Photo: Mattieu Lorry-Dupay.